Somehow, after following sprawling and oblique Google Maps directions through the spaghetti-highway maze that is Milwaukee, we arrived at the inimitable Three Brothers. It’s a bit tricky to get to, but you’ll know you are in the right place when you see the Victorian building with the blue and green Schlitz globe on the roof. The weather-worn corner building in fact was once a Schlitz tavern. Once inside, there are a row of formica tables and chairs topped with mismatched china and vintage lamps. 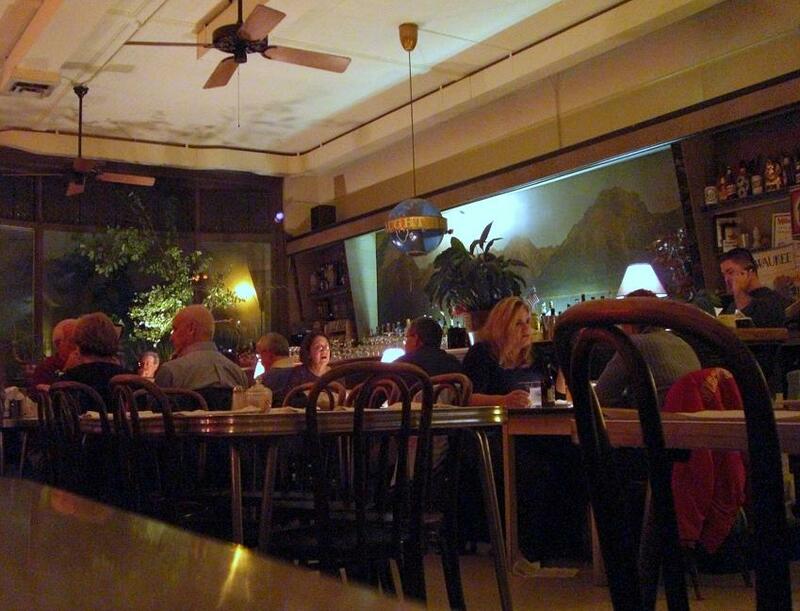 A wooden bar runs the length of the rest of the space, though there are in fact no bar stools. Though it may have a humble appearance, Three Brothers is actually a 2002 James Beard winner, and has been run by the Branko Radicevic and his family for over 50 years. We were greeted by a friendly server with a slight accent, perhaps part of Radicevic clan, and we quickly placed an order for burek (more on that later). The menu had a variety of Serbian dishes including pljeskavica, akin to a type of Serbian hamburger, roast pork, cevapici (a blend of grilled beef and veal) and sarma (stuffed cabbage). 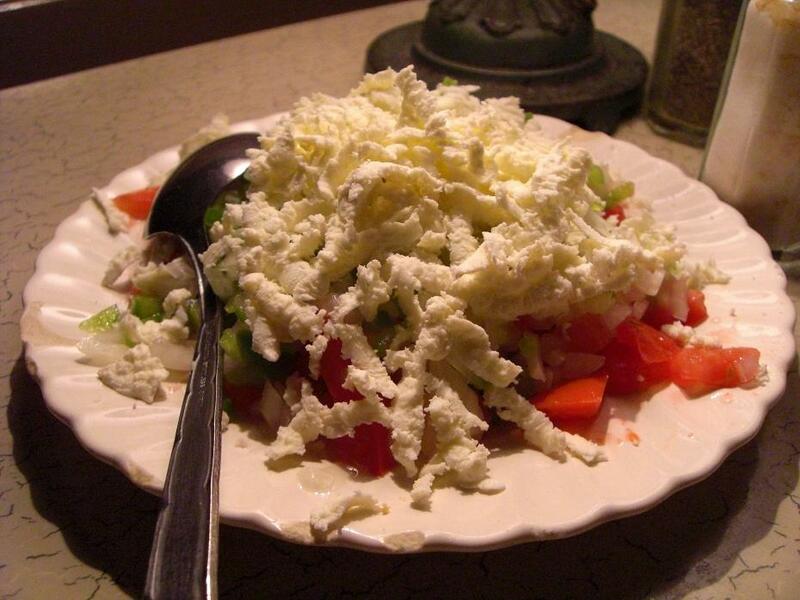 We started off the meal with a Serbian Salad, which is not a “salad” in the proper sense of the word – it consisted primarily of salty feta, some green pepper, onions and tomatoes. Not that we had any objections to a salad consisting mostly of cheese. M ordered the Chicken Paprikash, which like most everything at the restaurant was completely over-sized. The dish came with 2 pieces of falling-off the bone chicken, and a rich creamy sauce, with a hint of paprika. But of course the star of the meal was the burek, which every review we have ever seen, raves about. Since we had ordered it when we sat down, it arrived right along with the other entree. As you can see above – this Burek was no joke. It arrived at our table as big as a dinner plate, and probably about 4 inches tall. Think Greek Spanakopita on steroids. We ordered the cheese burek, which arrived piping hot with loads of feta and spinach sandwiched between layers of buttery phyllo dough. Between the 2 of us we barely ate 1/2 of the burek, which meant we had quite a lovely lunch for the next day. We think it’s garnered its glowing reputation with reason. Though it was hard to get to, making the trek to Three Brothers was definitely worth it for some delicious Serbian food in a friendly family atmosphere. We can understand why it’s been a Milwaukee institution for all these years. but worthwhile find in Milwaukee! Tremendous home style cooking from the old country. Real Comfort Food! Came here after Googling “Serbian Salad Three Brothers” and lifted the description from here to include in a Yelp review; thanks! Next time I go there I may order this for the appetizer and again after the meal to clear/cleanse the palate. It’s that good.